Quad launches VA-One valve amplifier | What Hi-Fi? Quad's latest valve amplifier combines the worlds of analogue and digital. 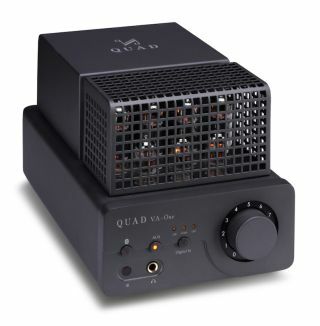 The Quad VA-One (£1400) uses three different models of valve which serve up a total of 2x12W amplification. Connectivity includes analogue and digital inputs, with optical, coaxial and USB Type B all available for connecting your digital sources. File compatibility extends all the way up to 24-bit/192kHz. There's also Bluetooth connectivity (including aptX) if you want to use a straightforward streaming option from a smartphone or tablet. The chassis is finished in Quad's classic Lancaster Grey and features a motorised potentiometer on the front, together with input and pairing controls and 6.3mm headphone jack. You can get a first look at the new amp at the Headroom Show, 29th-30th January at Metropolis Studios, London.